(2) His army is joined by reserves stationed at Tharbad on the river Gwathló. (4) Sauron's army is routed. Sauron himself flees toward Calenardhon, where he will face further defeat before finally retreating to Mordor. After the destruction of Eregion, Sauron's forces overran Eriador, and by the year II 1700 his armies had reached as far north and west as the River Lhûn. Meanwhile, Tar-Minastir of Númenor had sent a huge force of his own to support of the Elves of Lindon, and with the help of the Númenóreans, Sauron was forced back southwards. Retreating towards the River Gwathló, Sauron received reinforcements from Tharbad, but was ambushed by a second Númenórean force. The Númenóreans had sent a part of their fleet southwards, and so another great army from Lond Daer lay in wait for Sauron's force. The two armies met in the Battle of the Gwathló, in which Sauron was utterly defeated, and nearly captured. He fled back to Mordor, and so the Númenóreans succeeded in freeing Eriador, but earned Sauron's hatred. We have few specific details about the disposition of forces in the battle, but we can deduce certain facts with a degree of confidence. We know that the Númenóreans landed at the mouth of the Gwathló, at the port of Vinyalondë (later to be known as Lond Daer). 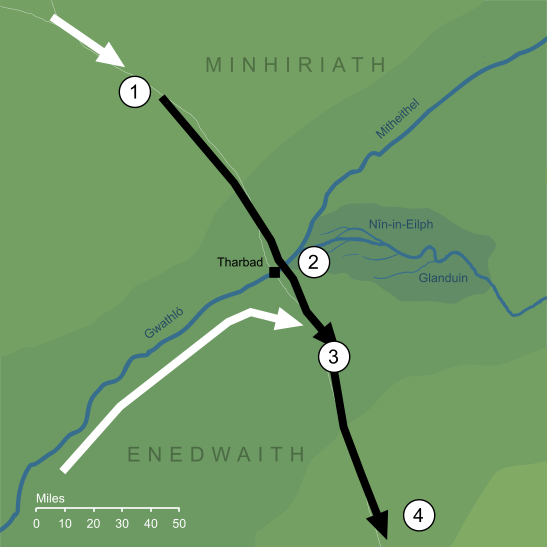 Given that the battle took place close enough to the river for it to be known as the 'Battle of the Gwathló', it seems unavoidable that the Númenórean force followed the course of the river to Tharbad, either by water or by land. We're specifically told that Sauron had been reinforced from Tharbad before the battle, and also that the Númenóreans attacked his rear. Both those facts point to Sauron moving away southward from Tharbad when the battle took place. On this assumption, the battle would not have been literally on the river Gwathló, but some miles southward of the river-crossing at Tharbad. Original content © copyright Mark Fisher 2009, 2018. All rights reserved. For conditions of reuse, see the Site FAQ.